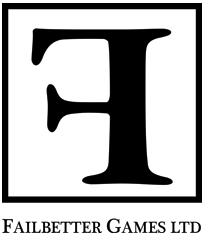 Failbetter Games is an independent game developer based in London, founded in January 2010 by Alexis Kennedy and Paul Arendt. The developer is known for the expansive world-building and storytelling in their games, such as in Fallen London, resulting in increasing notability. The developer was also contacted to develop The Last Court, a text-based adventure included as part of Bioware's Dragon Age Keep web application. Initially mostly restricted to Interactive Fiction, Failbetter began to experiment with more avenues, resulting in Sunless Sea, a top-down exploration game with roguelike elements and Failbetter's trademark flavor. In 2016, co-founder Alexis Kennedy left the company, desiring to work on his own smaller projects, the first of which being Cultist Simulator. Nameless Narrative: A cornerstone of Failbetter; in every one of their games, most characters' real names are unknown and they are usually referred to as 'The Adjective Noun'. They even go to the extent of taking well known characters from Dragon Age in The Last Court and only referring to them in this way. Recurring Location: Outside of London and the Unterzee (which do not count since they are the main hubs), the Tomb-Colonies, Mutton Island, Hunter's Keep, the Iron Republic, Port Carnelian, Polythreme, the Mirror-Marches, Abbey Rock, Adam's Way and the Chapel of Lights can be visited in both Fallen London and Sunless Sea, and the Avid Horizon appears in all three Failbetter games. There's also New Newgate Prison, which failed to make it to Sunless Sea since it was planned to be part of the game's dirigible expansion which didn't manage to be funded via Kickstarter. Schmuck Bait: Mostly seen in their games set in the Neath, but if one of their games tells you not to do something, don't do it. What awaits you is never good.